This could very well be the story of David and Goliath in Texas. 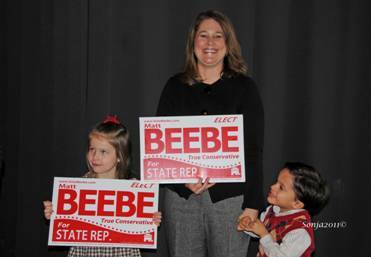 Matt Beebe, an entrepreneur who relocated to San Antonio about 10 years ago, has decided to take on Joe Straus of HD 121. He is challenging Straus, known to the conservatives as the infamous Texas House Speaker. 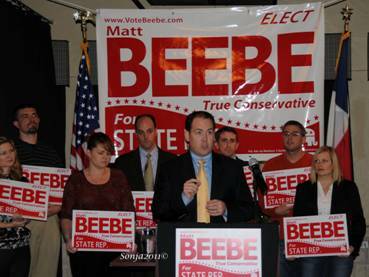 Beebe officially announced his intentions on December 12th at the Quarry Golf Club in San Antonio, Texas. He was welcomed by supporters and family. Beebe spoke about the shell game Straus played with the Rainy Day Fund and about how the budget maneuvering was going to come back to bite Texans in the next legislative session. He brought up the gambling situation that is waiting just around the corner for Texans. Beebe cautioned that the unions that will provide workers for the casinos will not enter a Right to Work state and are demanding an exemption. This alone signals a bad precedence to our state and will promote economic problems. He also said that gambling was not good for Texas communities as a whole. He promised that he would be anti sanctuary city and that he would work hard to secure our Texas border and request employer restrictions on hiring illegals. He spoke of the human trafficking problem that exists on IH35 that moves 18,000 to 20,000 illegals into our cities. He believes that Texas jobs are for Texas citizens. Matt and his wife Nicole have two adopted children, Hannah 5 and Joshua 3, so he very well understands pro life issues and is committed to taking a stand for family values. He and his family are members of the Alamo Heights United Methodist Church and Hannah is enrolled at the hybrid Summit Christian Academy, a university model homeschooling system. Matt is a graduate of Michigan Technological University and served in the Air Force as a communications officer and counter measures engineer working on cyber security. He is the owner and founder of Digitactics and has 13 full and part time employees. You need to check out the underhanded, sneaky, and illegal things Matt did as a contractor to the government. He was fired for the activity. He is very sneaky. NO ONE beats your daddy !! NO ONE could be more "underhanded, sneaky or ILLEGETIMATE" than that snake in the grass LYIN RINO straus !! Well-l-l-l looks like we have our 1st straus infiltrator & mole !! Seems they dont even have the guts to put a name ??!! Where is my reply to anonymous ?? Why isnt my reply from last nite not posted ?? R we only posting negative straus supporting comments ?? Thank you for your recent comments on Matt Bebee. It would be the right thing for you to step up now and divulge details to your accusations. Without concrete evidence what you have to say are just hearsay.